Along with many other people, my family was able to go and see Disney's Zootopia this weekend. My kids have been excited to see this movie for quite awhile. We were not disappointed. The movie was fantastic and presented some great lessons as well. Because we had such a wonderful family time together, I knew I had to create a fun lunch for my kids to take to school today. Plus I have some FREE downloadable Zootopia coloring sheets for your family, just scroll to the end of this post! I made the lunch in an Easy Lunch Boxes container. I won't pretend this was an easy lunch to make. It took way longer than I expected it to. Because of this, I won't bother with instructions because they are pretty self explanatory, but I will give you the ingredients below. I recommend taking your family to see Zootopia and then maybe have some more fun by making them this lunch! Remember to follow me on all my social channels, the buttons are on the right of this page. white cream cheese, purple food coloring, pink sprinkles, blueberries, blue edible modeling dough. 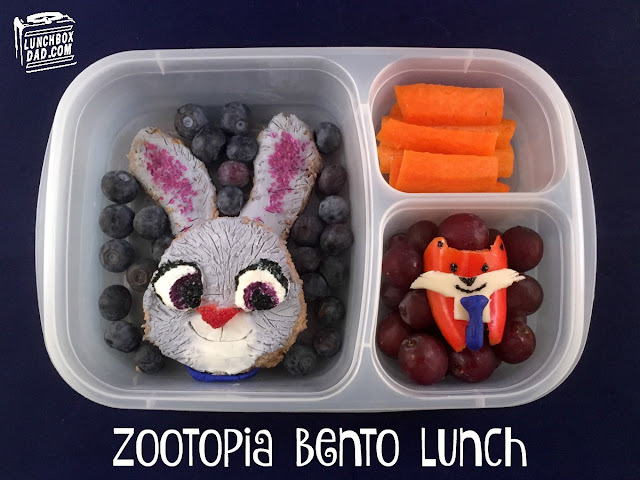 Nick Wilde: Red sweet pepper, provolone cheese, black food coloring, blue edible modeling dough, grapes. 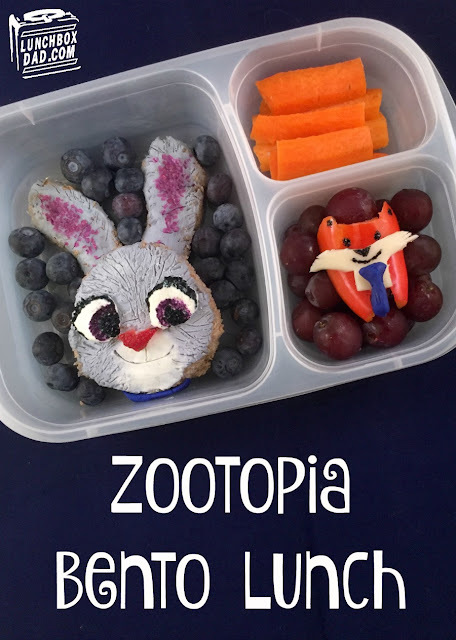 FREE Zootopia downloadable coloring sheets!